Vincent Price and Roger Corman tackle Shakespeare in this impressive faux-AIP Gothic. MGM US R1 DVD. Our dreadful marches to delightful measures." 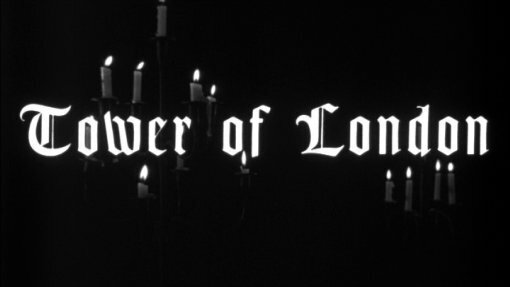 Despite appearances, The Tower of London is not an AIP Gothic, but was actually produced by Roger Corman's brother Gene, for the independent company Admiral Pictures. Inspired by the 1939 Universal Horror film of the same name, the script is based on William Shakespeare's Richard III, which was based very loosely on history (and is believed to be largely Tudor propaganda, intended to provide a moral justification for their rather shakey claim to the English throne). As far as Shakespeare adaptations go, the script here presents a very much abridged take on preceedings, but provides a basic over-view of the story, Richard himself retains the clever and scheming characteristics from the play and the misshapen appearance that Shakespeare bestowed upon him - although noticably none of the play's humour is attempted (not necessarily a bad thing), nor the distinguishing between Richard's motivated anti-hero persona before his crowning, and his nearing paranoia afterwards. Ignoring ties to the play, however, Tower of London's script is strong and has a good theatrical atmosphere, retaining the Shakespearian dialect even down to soliloquies. The film's low budget keeps most of the action within the Tower itself and the script is largely dialogue based, but especially for theatre fans this is very enjoyable - the short (80 minute) run-time keeps the pacing brisk, although the climax is very rushed and disappointing (largely due to budget cuts). Originally planned in colour, but kept in black and white and with repeated budget cuts by executive producer Edward Small, Tower of London does actually look very good. While Corman shot his AIP Gothics in colourful, scope widescreen, here he uses a much more open format, that suits the dialogue based, theatrical nature of the film better. The black and white photography does it no harm either, giving the film a very dark and menacing feel, which combined with the strong set designs and costumes, helps to make the film look very good, although the small scale of the production is noticable throughout, despite the best efforts of the script. The climactic battle of Bosworth Field is largely edited from footage shot for Universal's 1939 film, which works to a point, but does lead to the rushed conclusion. An effective orchestral soundtrack helps to give the film a solid backing. Vincent Price was obvious casting for the lead role, incidentally he had made one of his first film appearances in the earlier Universal Tower of London (1939). Going for all out theatrics, Price's performance here is very different to his usual, often casually understated cinema villains and he is often criticised for "hamming it up" - however, overacting is often seen as part of the fun of Shakespearian performances and Price certainly seems to be entering into the spirit of the piece. There are no other memorable names in the cast, but there are generally strong performances all round. Tower of London is nicely written and well produced, considering the low budget, with a good central performance from Vincent Price. A real contrast to the AIP Gothics it is not for everyone, but fans of Vincent Price should certainly enjoy, and it might well prove of interest to Shakespeare fans looking for something a little different. Partly recommended. Directed by anyone interesting? Roger Corman - a long serving producer, he is perhaps best known as a director for his series of Gothic Horrors, including House of Usher (1960) and The Haunted Palace (1963). Any gore or violence ? None. Who is it for? Partly recommended generally. Of interest to Price and Shakespeare fans. Visuals Original Aspect Ratio - 1.66:1 non-anamorphic widescreen. Black and White. The print quality is generally very strong with only mild grain and minimal print damage. Audio English language original mono sound. Sounds fine. Availability Available in a double-bill pack with AIP Gothic horror The Haunted Palace, on a dual-sided disc. Part of the MGM Midnight Movies series. Other regions? Japanese DVD release, not available in the UK or Europe. Cuts? None known. The print is English language. A real change from the AIP Gothics, Tower of London is a nicely written film, although suffering from low budget. Partly recommended. A good print with an interesting interview piece, although no trailer, and the non-anamorphic print is not ideal, unlikely to receive a better DVD release any time soon. Find more films starring Vincent Price or directed by Roger Corman. All text in this review written by Timothy Young - 21st January 2007.